Ladies and gentlemen, and children everywhere, your Chicago Children’s TV Show* is on again, with more laughs, thrills, and chills for your television entertainment! Revisit the history of such Chicago treasures as Kukla, Fran, & Ollie; Super Circus; Garfield Goose & Friends; Elmer the Elephant and others as we celebrate the past and present of locally-produced children’s programming! With appearances by contemporary children’s programmers Chic-A-Go-Go, Barrel of Monkeys, Elephant & Worm, and Adventure Sandwich! Music by the Old Town School of Folk Music’s Young Stracke All-Stars and Prof. Justin Amolsch’s Big Brass Band! Acrobatics by performers from Aloft Loft! Cartoons by Chicago artists Lilli Carre, Drew Dir, and Emily Kuehn! Prizes for children and adults by Busy Beaver Button Co.; Derek Erdman; Kathleen Judge; Poetry; Victory Gardens Theater; Uncle Fun; Hansen Mansion; Barrel of Monkeys; Wee Hairy Beasties; Elephant & Worm; Drinking & Writing Theater; and the Chicago History Museum! Starring August Sasaki, Fred Sasaki, Kenneth Morrison, Martin Billheimer, and Jerry Boyle! Directed by Meredith Milliron. Set design by Sarah Crawford. Tech assistance by Ben Chandler and Nick Fraccaro. Makeup design by Brittany Bodley. 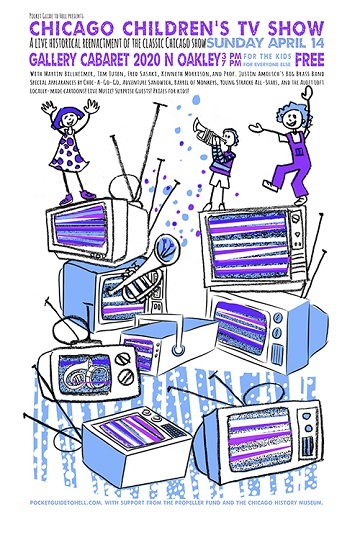 Chicago Children’s TV Show is the second installment of the Chicago Television Project and was preceded in November by Studs’ Place. The second installment will look at locally produced children’s programming, once rich and varied but now largely non-existent. Audience members will learn about Kukla, Fran, & Ollie; Garfield Goose & Friends; Super Circus, and other locally-produced children’s programs beloved by many Chicagoans. The “new” episode will highlight the work of individuals in the city committed to producing fun and engaging programming for children. The Chicago Television Project has the generous support of the Propeller Fund. *formerly Bozo’s Circus, until stopped by the estate of the World’s Most Litigious Clown!